When did you last go to a public library? No, really, when? It’s probably a good few years – and if so, you’re not alone. From one year to the next, nearly 60 per cent of us don’t go to libraries at all. In fact, fewer than one in five adults in England go more than once a month. A couple of weeks ago, since you ask. Far less often than when I was a child and went on a weekly basis. I relied on the library for books that were more challenging than the ones available to me at primary school and to allow me to read wider than my secondary school library allowed me to – they only had one Gabriel García Márquez book, for example – the library had far more. But children still need libraries. Far less than when I wasn’t a student or working in a university and was fortunate enough to have access to academic libraries. People who can’t access academic libraries can benefit from public libraries – and far fewer people will be able to go to university now. And far less than my grandparents and the elderly people I know, who rely on them for large print books that they can’t buy at the supermarket, and can’t afford in the numbers they get through. The elderly rely on services like libraries to keep them engaged and active. We’ve got an ageing population. Nearly 60% of us don’t go to public libraries? 40% seems to a pretty good proportion of the population to make a service valid. I wonder what proportion of the population uses schools each year? And the emergency services? I think more people should be using libraries, absolutely – but because there is a very real need for them. People who aren’t using them now could benefit from them – the children whose parents don’t encourage them to read, the old people who can’t get out and about enough to get to the library and might not have access to a home delivery service, the unemployed young people who can’t go to university or college but want to train and can use the books and online resources available through the library. Heck, the middle class white males who might be able to save a few quid now that they’ve been made redundant but still want to be able to go for a hike using the OS maps they can borrow, or use the car manuals, or some other terribly gender-stereotyped example I could provide. 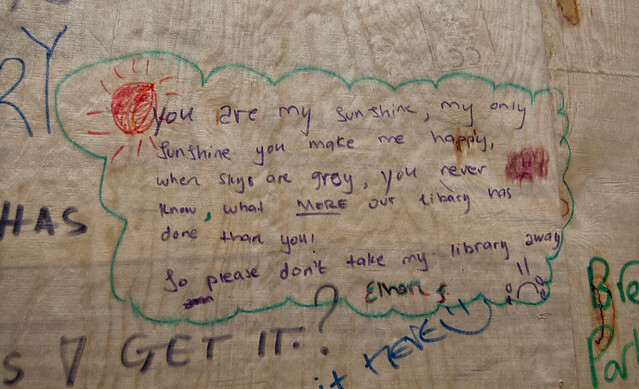 The news that councils are closing libraries has prompted sickly and sentimental pleas from all corners of the nation: a long and star-studded campaign to stop Brent Council closing six of them is now set to go to the Court of Appeal. No less a figure than Brian Blessed recently described such closures as the “act of Philistines… atavistic nonsense… the nemesis of our country”. John, you’re right. Some of the responses from celebrities have been horribly sentimental. Many very dramatic. Is this surprising? It’s what they do for a living. Librarians and information professionals are providing less dramatic and more evidence-based reasons that library cuts are stupid. You can’t just dismiss celebrity condemnation because it’s dramatic, or because they themselves might not use libraries. In with all the hyperbole they also make important points, that you seem to be ignoring: “Not every family has a computer. Many of them are quite poor. The only way they can keep up with their classmates and have access to a computer and books as well is at the library.” These things are true, there is statistical evidence. In one sense, this is a phenomenon familiar to anyone who’s ever had to cut public services: people will fight to the death to protect things they never use. But there’s something bigger going on here. This is a fight by middle-class liberals to keep libraries open not for themselves, but for the less fortunate. This is partly out of condescension, and partly guilt – because the protesters don’t use libraries either, and feel they may have precipitated the closures by their neglect. People will also fight to the death to protect things they appreciate are of real value to society. I haven’t had to use the NHS for a year or so. But I’m glad it’s there. It’s such a specious argument to claim that if you don’t use a service you have no right to defend it. This is aside from the fact that it categorically isn’t just middle class liberals defending library services, and across the country people from all walks of life and all political persuasion are up in arms about disproportionate and counter-productive cuts to a service which is seen by politicians as anachronistic, complicated and not worth their time or (our) money. What this debate needs is some honesty. Yes, public libraries have been of huge benefit in helping us educate ourselves over the past 150 years. It’s an honourable tradition – but it’s over. Their defence depends on a deficit model, the argument that they fill a unique gap. But that’s simply no longer true. Thing is, John, it is still true. I know it’d be nice to think that everyone has access to all the education they need through schools and universities, but they don’t. Many children go to schools without libraries, because they aren’t statutory (but absolutely should be). Many people didn’t succeed at school but want to improve their level of education and standard of life now. Many adult learners rely on public library services. And society as a whole benefits from full participation in a democratic society, access to excellent writing and trusted and accurate information. Tell me modern society doesn’t need those things, I dare you. Oh, you’re about to? Sugar. Take reference services, once the core of the public library’s educational role. Access to information has been transformed by the internet. Google a subject and you can become ridiculously well-informed ridiculously quickly. Engrossing lectures from the planet’s best minds are freely available on university websites, from the TED conference series, or on BBC iPlayer. Channels such as BBC Four or Sky Arts provide a wide range of high-quality documentaries across a multitude of subjects. We live in an information-rich society – so we should celebrate its availability, not yearn for a time when you had to go to the central library for it. Google a subject and you can be come ridiculously well-informed ridiculously quickly, if you have an appropriate level of information literacy and the skills to find what you need and work out what’s reliable and what isn’t. Maybe that Masters in Librarianship helps you find what you need to ridiculously quickly. Other people need a bit more help. Without the level of ability, it’s easy to Google a subject and become ridiculously mis-informed ridiculously quickly. Not everything is available on the internet. Honest. Not everything is televised. Sorry. Not everyone can afford a tv and/or satellite tv – no, seriously. And not everyone wants one either. We live in an information-rich society – so we should ensure that everyone has access to information and make it more available, not yearn for a time when there were places people could access information, in the good old days when people gave a toss about other people and wanted a successful society with good levels of literacy, employment and engagement. In recent years, libraries sought to reinvent themselves as information hubs. Hundreds of millions were spent to provide them with computers. What happened? Technology advanced, and soon the library computers were too old and too slow. That led to a demand for more investment. But why? Fast, cheap computing had spread to most homes, and to our whizzy new mobile phones. Where on earth is the gap that libraries are meant to plug? Yep, libraries got computers. And rightly so – after all, libraries provide information, and as you rightly say, a lot of information is available on the internet. This was probably around the time you stopped working in libraries, John, so I can forgive your ignorance about anything that’s happened since. But it might have been a good idea for you to keep schtum about stuff you have no idea about. Or done some research for your piece on your whizzy new mobile phone. This is a big social problem, and it’s known as the digital divide. There’s even a national campaign. Then there’s the argument that your local library is the gateway to a national and international network of literature and education. So it is – but so is your computer. Time was, to get hold of a particular book, you would have to go to a library and ask. Now, with Abebooks and Alibris, almost all the second-hand bookshops in the world are available to search. This is as true for new books as for old: more than 130,000 titles were published in the UK in 2009, and 330 million new books were purchased. I think I covered this bit with the whole “this only works if you’ve got a computer and millions of people haven’t” argument. Time still is, to get hold of a particular book, you have to go to a library and ask. This is also ignoring all the other things that libraries do – help people get hold of books they didn’t know how to ask for other than “it’s got a red cover and the story goes a bit like this”; help people learn how to use computers and new technologies; help people find information about their local area and how to get involved in local and national democracy; a million other things. Online book stores are brilliant, but they don’t meet every information need, and a lot of people can’t use them. A significant number of people don’t even have a bank account, so that’s online transactions out the window. The final defence of the public library is that it is a place for the pupil who has nowhere else to study and revise. Once again, this is the 21st century. Virtually every kid has a desk at home – even if it often has a games console on it. And libraries at secondary schools are, in my experience, uniformly good and open places for young people. Spend some time in a public library near a school or residential area after school hours, or in the holidays. You’ll soon realise this point is completely inaccurate. Recent research suggests that 52% of young people use libraries. Although public libraries do not disproportionately attract young people from more or less affluent backgrounds, 47.8% of the children in the National Literacy Trust study received free school meals, which is a crude indicator of socio-economic background. Of the children who receive free school meals (and a lot of those entitled to do not), a lot of them will be living in poverty. Newsflash, John: the UK has one of the worst rates of child poverty in the industrialised world. Nearly 4 million children are living in poverty in the UK. So forgive me when I continue to argue that libraries are needed by children who don’t have a desk at home, or a space in which they can work without fear, in peace and quiet, somewhere that they feel valued, and worth something, and like there might be a way out of the situation they’re in. Libraries at secondary schools are often great places, but as I’ve mentioned, a lot of schools don’t have a library. A lot of pupils also refuse to use school libraries but will use public libraries instead, for a number of reasons, including stigma, or practical reasons such as having to go home straight away after school because of travel arrangements. Few institutions are timeless. Most reflect the period when they were created, and have to change as society changes if they are to survive. The crisis in our libraries is not because of the “cuts” – it’s because they are needed less. Libraries do have to change as society changes – and in many ways have (see: online catalogues, electronic resources, computers and so on). The crisis in our libraries is only partly because of the cuts (though why you felt the need to put cuts in speech marks is beyond me – they’re very real), and partly because councils have failed for a number of years to adequately invest in and promote their library services. There’s been a lack of leadership and a lot of mismanagement. But that does not mean that libraries are no longer needed. They’re needed now more than ever. Well said! His ignorance left me speechless this morning! What a brilliant expression of librarians’ collective outrage, thanks Lauren! What we need are more golf courses. This was such a privileged, ignorant article, and your response is beautiful. Not everyone knows or wants to have a clear idea of the genre, style, topic or type of book/information they want – libraries provide access to myriad examples. They are essential for learning, opening up to new information and accessing that which one might not otherwise discover. Well said, Lauren! What a great response,Lauren; extremely well arguued and what we were all saying. An excellent response to a ridiculously ill thought out artical. Maybe one day there will be a time when libraries are not so vitaly important but try as I might I can not imagine it. Dear Telegraph – I challenge you to print this response! Good response. That article made this liberal whinger want to whinge a lot more. This was an excellent, measured and well thought out response. Thank you for making it on behalf of all of us. Excellent response (to what was a ridiculous article) – particularly glad you made the point about young people not all having desks at home (certainly not in a quiet home conducive to good studying) and school libraries not always being ideal (for a start, many children risk being bullied if caught using them). While McTernan claims authority by saying that he “worked in libraries” from 1984 to 1994, much of this experience seems to have been limited to running the library of the Labour Party. During this period, the library transferred its archives and other historical material to the National Museum of Labour History, and focused instead on its other role of providing active support for policy development and election campaigning (presumably a nice springboard for McTernan’s later career as an advisor). According to McTernan’s own account – published in the Library Association Record 94(5), May 1992, p. 322 – this largely related to undertaking searches of online press cuttings databases and government datasets in response to a rapidly changing news agenda. Given this background, maybe it is not surprising that McTernan thinks that Google can do everything that libraries might hope to do? Thank you thank you thank you Lynne, for taking the time to articulate this reasoned and informed response. How can we make sure John reads it! Well, I am computer literate, have access to a computer, use abe.com and amazon, know how to search the internet, and evaluate websites. I also have access to a nearby national deposit library, but I find that I am using my local public library as much if not more than in the past. There are many books which I borrow through the public library inter-library loan service, which I cannot read anywhere else. Brilliant article Lauren, thanks for demolishing McTernan’s blinkered, condescending and inaccurate piece of spite. Great response. But what has me reeling is your statement that some schools don’t have libraries. This is mind-boggling!!!! I am really having trouble taking this in. Many thanks Lauren, for your time and patience to respond to this, so eloquently! There’s been so much pontificating from people who don’t know what they are talking about this year (politicians, journalists, Councillors, Chief Executives, the list is endless) that as a public librarian, I lost the will to live many months ago. It seems nigh on impossible to change the hearts and minds of folk who just ‘don’t get’ libraries and their relevance and value to so many sections of our communities. It’s heart-warming that there are still people like you with the energy to keep responding! Thank you. Wendy in Somerset. John McTernan might never touch a keyboard again after that. McTernanbeen has penned popular prejudice, he has also not worked in libraries since 1994, which could possibly explain why he hasn’t felt able to respond to this prejudice (he no longer has any knowledge of the field in terms of that which would enable him to comment on policy – I’m also not sure that he even had enough experience in the field to gain such knowledge in the first instance). I would have expected an MA to show a tad more research and critical thinking skills. Quite ironic that the Telegraph published Philip Pullman in response, giving more fuel to the argument that it’s ‘liberal’ media types and writers who are whinging and leading the fight against library closures, not librarians and the ordinary people that use them. Great response – thank you! I’m also one of the middle-class liberals having a whinge. But I use my library at least once a fortnight. I like to read fiction and there is no way that I could store/afford all the books I read. Yes, I could probably get 1000 out-of-copyright books on my laptop, but I want to read the books that are being published now and my library helps me to do that – they are wonderful. Lauren has done a wonderful demolition job here, ironically echoing the more literal domolition of libraries that she rightly combats in a wonderful display of knowledge and passion. Thank you for saying everything I wanted to say to this pompous, short sighted, self satisfied idiot. And that last quotation is perfect. So another area where his assumptions are very wrong. Thanks so much for this Lizzie, I’ll edit the post to include it. Coming late to your post via CILIP ‘Media Watching’ – you are quite right to point to the outrageous ignorance of the article’s author. I, like I suspect the majority (i.e. more that 90%) of UK citizen’s haven’t used the M50. Dig it up and stop it being a burden to the taxpayer. What absolute BS. If 40%+ of people voluntarily make use of a public service and this is considered bad use of public funds, then, there is no hope for any of the other services we very very very rarely get to use, want to use or have to use. As I wouldn’t touch The Telegraph with a 40 foot barge pole, I too had missed this appalling diatribe by John McTernan. Well done for this fantastic response – the only response I came up with was a string of four-letter words ending in ‘t****r’. As a school librarian – it’s where I picked up my colourful language – he is completely wrong to say that secondary school libraries are uniformally good. Even if they are – and many are most definately not – we too are under constant threat of redundancy and closure. Alan Gibbons’ Campaign for the Book has obviously made no impact on this man at all – I’ll suggest that Alan adds McTernan to the mailing list for his regular newsletter about the campaign. Thanks again for encapsulating what I would have liked to have said. Great article Lauren, wished I’d seen this back in October when published. As a keen user of Rugby Library (until we move away from the area) I know just how popular the library is – for toddlers (Mums & toddlers group), school students, pensioners learning IT for the first time, migrants who want to skype home, historic archives and for me (part of the great unemployed). Fact is, we can’t afford not to have libraries!